Margot located on Division Street is an eccentric collection of apartments. Intimate in size but grand in design, they will allow you to truly make this your own. Be the first to step in one of our studio or one-bedroom homes created for those that want the best in urban location and design. Select homes include vaulted ceilings, skylights and city views. 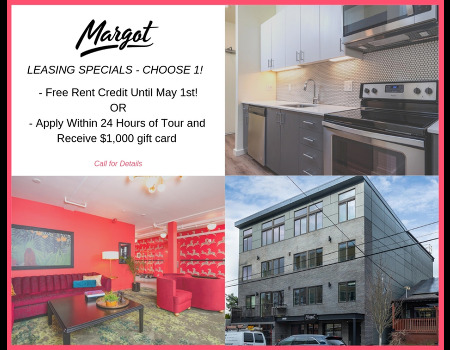 Nearby shops, coffee, and restaurants will allow you to grab Indian street food or artisanal ice cream with friends and proclaim your love for Margot! Two pet maximum allowed per household. Pet deposit is $300 for one pet, and $450 for two. Monthly pet premium is $15 for one pet, and $25 for two. Please note that German Shepherds, Doberman Pinschers, Chows, Rottweilers, Pit Bulls, American Staffordshire Terriers, and mixed breeds including any of the above are not allowed, unless they are an assistance or companion pet.